History comes to life through individual stories. This two-part guest post by retired Dayton police sergeant Stephen C. Grismer gives a wonderful view of how one family’s business changed and adapted in the course of more than a century, reflecting life in the community around it. Steve serves as secretary-treasurer of the Dayton Police History Foundation and has been a wonderful source of information for the Maggie Sullivan mysteries. Part 2 will run next week. Thanks, Steve! With my family ancestry rooted in Dayton, Ohio, as far back as 1851, I enjoy a deeply personal connection to our local history. It began when my great-grandfather, Gustav M. Stomps, emigrated to the U.S. in 1848 and, upon settling in Dayton, opened a factory on East First Street where he manufactured chairs of all types. His son, Gustav H. Stomps, wasn’t interested in crafting chairs. His interest was transportation. He first owned a livery business downtown, but after losing 292 horses during the 1913 flood, he realized his future was best suited to automobiles. Gus first opened a Lexington Motor Company car dealership at 50 South Main Street, across from the Kuhns building, but in 1916 switched to Chevrolets. This was the automobile he and my family would sell in Dayton over the next five decades – through the Great Depression and World War II – until 1968. Given my ties, it should come as no surprise that I am a fan of author Curt Dalton and his many books on local history. One of my favorites is Home Sweet Home Front: Dayton During World War II in which he recounts air raid warnings and “black outs.” My grandparents, parents, aunts and uncles experienced these from their Dayton homes, while other family members more dangerously served abroad. This is the period setting for the Maggie Sullivan murder mystery series, each installment of which I eagerly await. The books strike a resonant chord with me, given my own police background, because private eye Maggie is closely linked with Dayton law enforcement of her day. More than the police connection, though, I love the author’s accurate descriptions of Dayton streets, businesses, districts, buildings, et al. from the bygone days of the 1930s and 1940s. In reading her series, I am drawn to my family legacy. When Gus Stomps needed a larger building to sell, maintain and customize automobiles, he opened Stomps Chevrolet at 225 South Main Street (near the corner of West Sixth Street). The building was constructed in 1928 and still exists today across from the Convention Center. My grandfather, John Henry “Hank” Grismer, was general manager. My dad and uncles all worked there. I would have as well had the doors not closed during my freshman year at Chaminade High School. 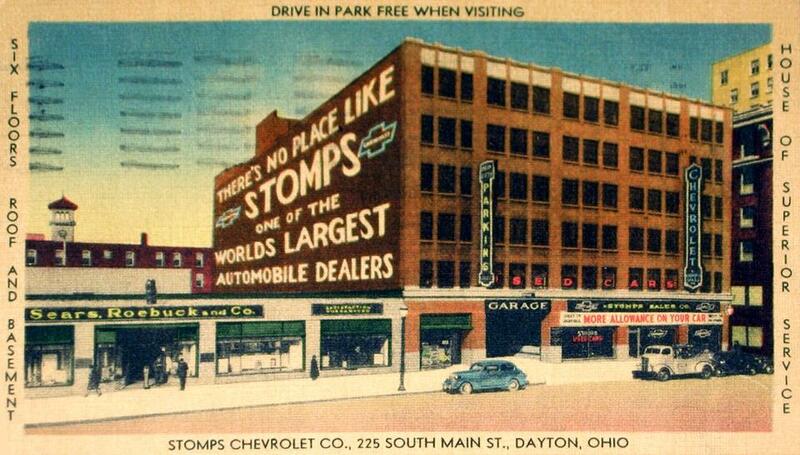 At the time, “Stomps” was said to be the second oldest car dealership in Dayton, and definitely Dayton’s oldest Chevrolet dealership. During WWII, Stomps, as well as the city’s oldest car dealer Borchers Ford , (further south on Main at Franklin Street) were located in the area known as the “Motor Car District.” This was a tightly compacted area which included the Dayton Buick Company at 349 South Main Street and the Citizens Motorcar Company (selling Packards) at Franklin and Ludlow. Today the latter location is the Packard Museum. Of course, with the swelling local population, other dealerships had begun to open in other parts of the city. But how would they survive World War II when there were no new cars to sell? 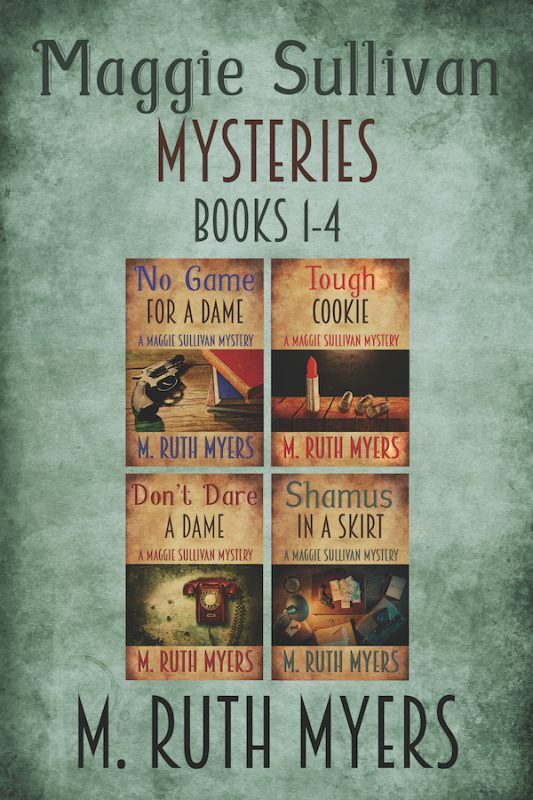 If you haven't tried the Maggie Sullivan mysteries, you can read the first book in the series FREE. Thanks, Nan! I’m glad you enjoyed it.